Hint: Point other readers to any section of this page with the URL + #hashtag of the header keyword. 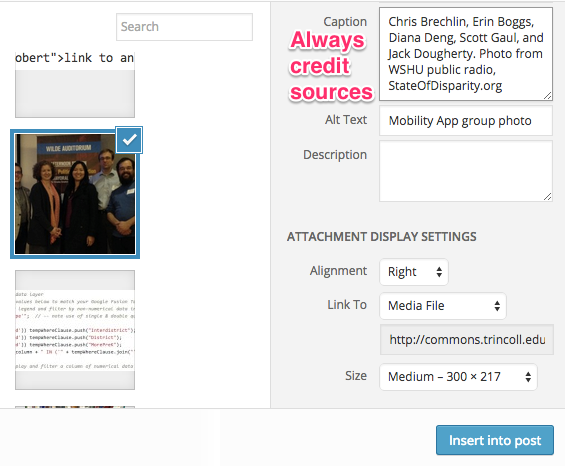 Example: http://epress.trincoll.edu/webwriting/chapter/how-to-publish-on-wordpress/#profile. 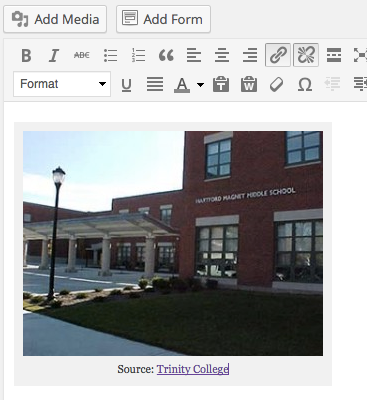 I designed this tutorial for my students to post their web essays on the WordPress.org multi-site platform hosted by Trinity College, known as Trinity Banter (http://commons.trincoll.edu). The general concepts and steps may be similar to other self-hosted WordPress sites. See also the Trinity Commons Getting Started support page. WordPress software can be freely downloaded from WordPress.org, and is the most flexible option because you can install plugins to expand features and upload themes to modify its appearance. But you must host your WordPress site on a server (called “self-hosting,” even if you don’t do it yourself). Hosting may be provided by your academic institution (such as the Trinity College Banter platform), or you can rent space and a domain name from an internet service provider, such as Reclaim Hosting for $25/year. WordPress.com is a freemium hosting service for your site. Anyone can sign up for a free account and receive a site with this domain format: http://USERNAME.wordpress.com. But the free service inserts advertisements on your site, and does not support plugins, unless you pay the premium subscription. While much of this tutorial addresses both versions, some steps apply only to self-hosted WordPress.org sites. 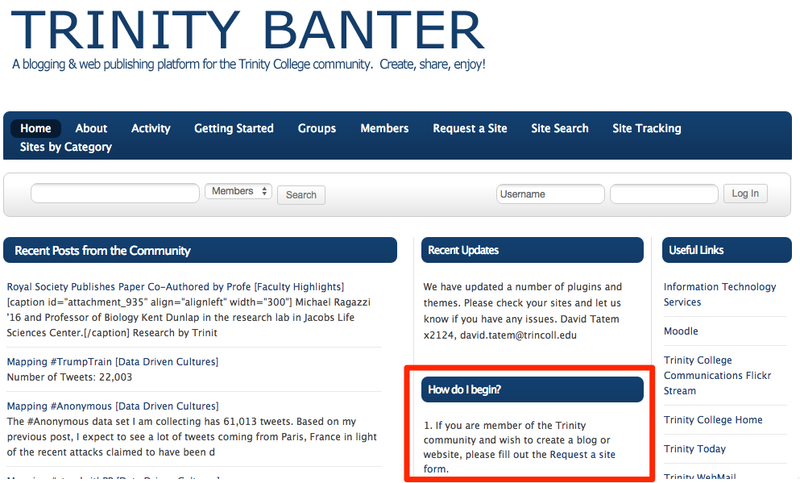 Trinity’s WordPress platform, Trinity Banter (http://commons.trincoll.edu) enables students, staff, and faculty to easily post content onto the public web, either on their own personal site, or a class or organizational site. To request your own site, click the link above, go to “How do I begin?” and fill out the online form. If you are enrolled in one of my classes with a WordPress site, I have already arranged for you to have an account with authoring privileges. After you log in, go to your Dashboard, navigate to your Sites, and select our course. 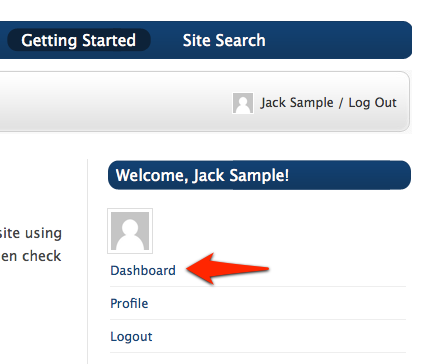 Go to Dashboard > User Profile settings, enter your first and last names, and choose how you wish your name to be displayed on the public web. I encourage (but do not require) students to use their full names. Also, if you describe yourself in the Biographical Info field, that content will automatically appear at the bottom of most posts, depending on the selected theme. Make wise decisions about what you publish on the public web and read the “Public Writing and Student Privacy” policy statement for our course, or my broader essay on this topic. Click “Add New Post” to open the WordPress editor. Add a descriptive title, type or paste in your content, and check the correct category (listed in the syllabus for each assignment) for your post to appear in the proper place on the class website and earn credit. Click “Preview” to see how it looks. Click “Save Draft” while working on your post, and “Publish” when it’s ready to appear on the public web. To encourage others to read your post, copy its unique web address (on the public front-end) and circulate via email, social media, or as a link on your resume. 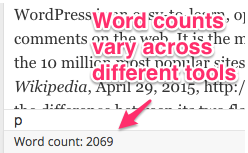 When I assign a maximum word count for a web essay, always check the WordPress indicator, which may vary from your word processor. In the visual editor, click the “kitchen sink” button to reveal a second row of editing tools. The magical “kitchen sink” reveals a second row of editing tools. To insert a link, select some text and click the “link” button. Select text and click the “link” button. 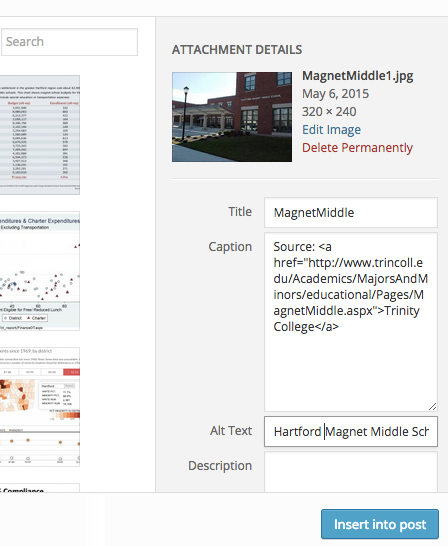 In the insert link pop-up, window paste or type in the destination link, and a quick title. Avoid forcing links to open in new tabs/windows. Nowadays I teach students to avoid checking the “Open link in a new tab/window” box in WordPress, because I learned that doing this creates serious problems for visually-impaired readers by forcing them into a new screen, with no option to use the back-button. Several web design guidelines, such as the W3C Working Group standards, recommend not checking that box.. To learn more about this debate, see the angry comments directed at this person who posted the opposite advice. You may wish to add anchor links to help readers navigate in longer multi-part essays, such as this sample: Jump to the Profile section. First, in the Text editor of the WordPress editor, type an ID inside any type of tag at your destination, such as the div tag below. (You also could do this inside a header tag (h1, h2, etc.). Before inserting an image, make sure you have the rights to include it and credit the original source. When writing about images that have been copyrighted by others, learn about “fair use” copyright guidelines andCreative Commons licensed material. To capture a screenshot from your computer, use the built-in commands for Mac (Shift + Command + 4) or Windows (Accessories > Snipping Tool), or download the free Skitch tool for easy renaming and resizing. To capture screenshots on other computers and mobile devices, see “screenshot” instructions on Wikipedia. Save images for WordPress in JPG or PNG or GIF format (not TIFF). To insert an image, place the cursor in front of the paragraph where you want it to appear, and click the “Add Media” button. In the Insert Media pop-up window, either drag and drop your image, or select an existing image or URL in the Media Library tab. In the Insert Media editor, add a caption, select your alignment (for text wrapping, try “right”), and select a size. Credit all sources in the Insert Media pop-up window. To edit or remove an existing image, float the cursor over the upper-left corner and click the edit or delete icons. To edit or delete an existing image. Before embedding video, make sure you have the right to include it and credit the original source. When writing about video that has been copyrighted by others, learn about “fair use” copyright guidelines and Creative Commons licensed material. To embed a YouTube video, click the “Share” button on the video site to reveal its web link (and start time, if desired). Paste the YouTube link and credit the video source below. In my Trinity course sites, I have already installed and activated the Google Doc Embedder plugin, which is poorly named, but does an excellent job of displaying PDFs from internal or external URLs. – Click Add Media and upload your PDF file. On the Media Library screen, make sure that bottom-right corner points to its media link. I have already activated the iframe plugin in our WordPress course site, which allows authors to embed a live website (such as an interactive chart, map, or other website) inside your post. 1) In your Google Sheet, File > Publish to the web. Click the Embed tab and the Publish button. Copy the iframe embed code that appears. 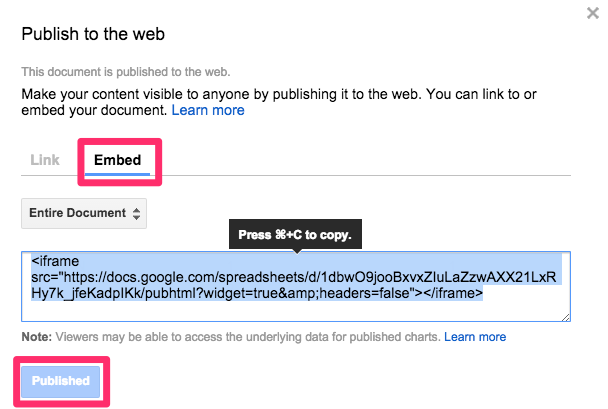 Publish a Google Sheet to the web and copy the iframe embed code. 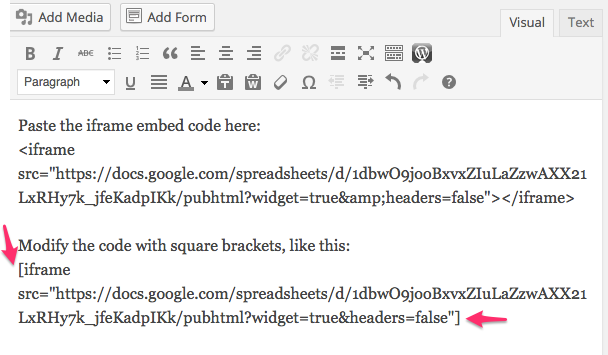 2) In your WordPress visual editor, paste the iframe embed code. Modify the front and back ends to include square brackets, and remove the “/iframe” tag at the end, to match the format shown below. Paste and modify the iframe embed code. To see more examples on how to embed interactive charts and maps inside your WordPress post, see the “Publish” section of my other book, Data Visualization for All, at http://DataVizBook.org. 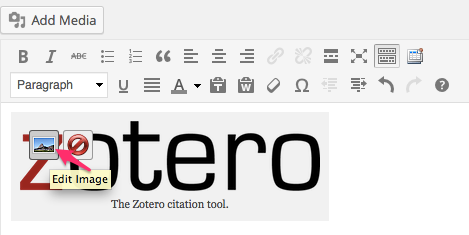 If you use the free Zotero tool to capture and cite sources, hold the shift key and drag items to insert as an endnote. Some of my course assignments allow two people to co-author a web essay, and I have set up my WordPress course sites to accommodate this. 1) Compose the text on a platform that’s designed for collaboration, such as Google Documents, because WordPress was not designed for simultaneous authoring and editing. 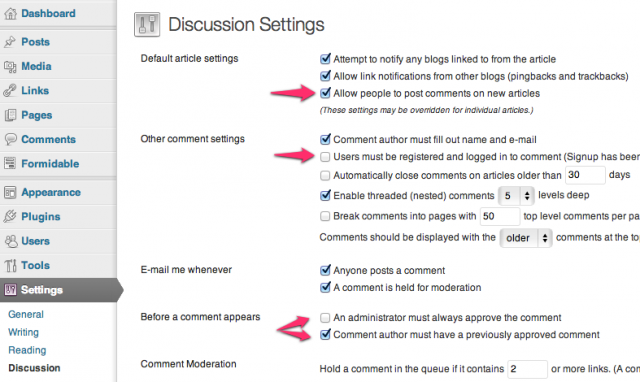 2) One co-author should log into the WordPress site and create the post. When pasting text from Google to WordPress, click the Paste as Text button to avoid bringing unnecessary code into your post. 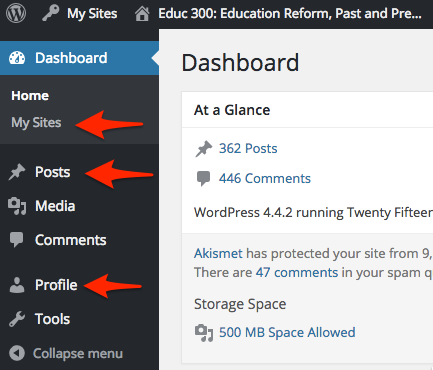 (If you don’t see this button in the WordPress editor, click the “kitchen sink” button to open the second row. 3) In my Trinity WordPress sites, I have already activated the Custom Author Byline plugin, which allows you to override the default display of the single author’s name who created the blog post. Look for the Custom Byline field under the WordPress editor window. If you do not see it, go to the upper-right corner, click the “Screen Options” drop-down menu, and make sure that Custom Author Byline is checked to appear on your screen. 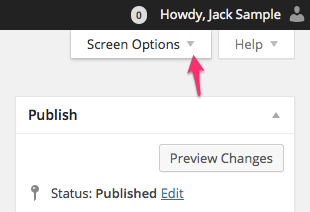 In the WordPress Screen Options, make sure Custom Author Byline is checked. 4) The names that you type into the Custom Author Byline will override the default single-author display, but the post can only be edited by one owner. Third, you can manually run Akismet to check your existing comments for spam, which is faster than deleting them individually. Go to Dashboard > Comments > Check for spam. 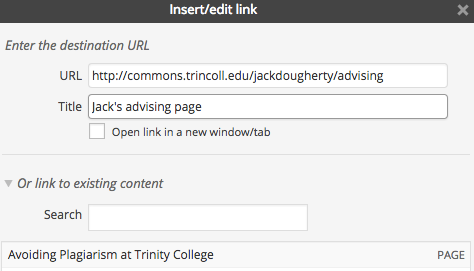 If you continue to have problems with WordPress spam on your Trinity Banter site, contact the HelpDesk@trincoll.edu and/or speak with your instructional technologist. How to Publish on WordPress.org by Jack Dougherty is licensed under a Creative Commons Attribution-NonCommercial-NoDerivatives 4.0 International License, except where otherwise noted.